This was supposed to be a post about a couple nice threshing shows this past weekend. Sunday morn’ was on my way to the second of those events in Butterfield, Minnesota, taking a lovely shortcut through the green goodness on a lonely county road. Then a red light on BMW’s much vaunted video game display started flashing incessantly. Now to fit all those lights onto the display, they had to make them tiny, and they put the low oil light which doubles as a “cooling fan failure” light and who knows what all else on the same circuit. So I pulled into the conveniently located wide spot in the road that doubled as a country church parking lot to investigate, shutting the engine off just in case it was the oil, etc. light and the engine was about to frag itself. 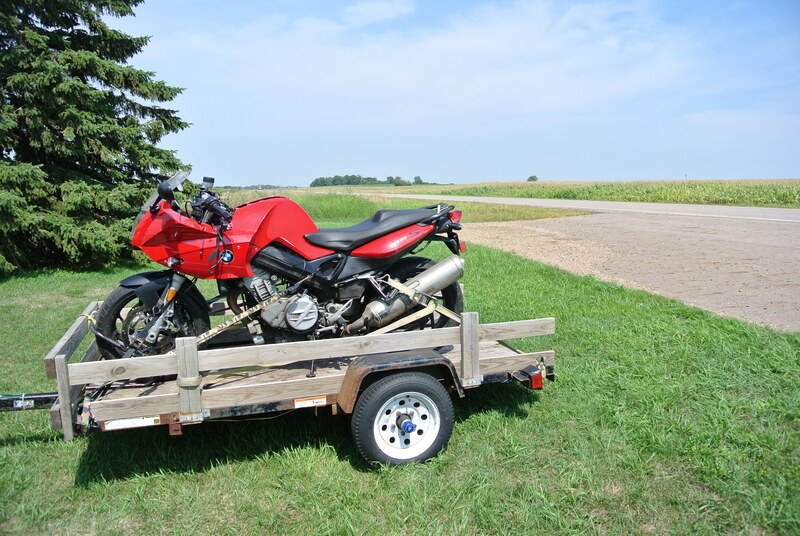 Turned out it was the ABS light, familiar sentinel to BMW F800 owners the the rear wheel bearing is self destructing, to the tune of $700 in parts alone. Checked the rear hub and barely warm and no play, fowl or otherwise. Wrote it off as another false alarm and went to restart… Nothin’ but clicks and the BMW video display flashing like a cheap tired pinball machine. Let the BMW sit a couple minutes, same result. Dug out the voltmeter, barely 11 volts. Undid the at least half dozen screws to just catch sight of the battery, no warm wiring and same voltage, took of the farkle feeding wiring, still barely 11 volts. Took off all the wiring, no diff. Cleaned the terminals, by now it’s sat a few minutes and barely able to spin the motor not even a revolution. Take more ATTGAT off and try bump starting… With 12 to 1 compression even in top gear the rear wheel just locks up. Drink some Dew, let it sit some more, still barely cranks with not a hint of combustion. Now BMW’s plan is that about now I’m supposed to call their 800 number and they’ll dispatch a tow truck to haul the broken BMW to the nearest BMW dealer where all will be fixed. “Cept I had no cell signal there, and the nearest BMW dealer is 150 miles away. And after that 300 mile tow, said BMW dealer won’t be open for two days and won’t have the part anyways and the mechanic will probably have never fixed this model anyway, given that BMW has spread their sales over a half dozen or so platforms so most will never achieve the critical mass to justify support. So a few weeks later, I’d get to trailer those 150 miles and pay $1500 or so to get this bug fixed the BMW way. Now I’m about 15 miles from home and 10 from the nearest town, with not a house in sight and little traffic. Clearly I’m gonna have to improvise… The charger for my Netbook is good for 18 volts at a couple amps, and I’m sittin’ right in front of a church. Turns out said church is vacant though somebody’s been keeping the grounds up, and the electric meter’s missin’ out back. Look around the horizon, nearest farmhouses seem to be at least the other end of the next quarter… But where’s that dirt road on the other side of the church go? To my good fortune that dirt road led to the Johnson’s century farm, on the same quarter their ancestors homesteaded in 1869. Mr. Johnson brought out his Suburban and jump started the BMW. Then when it died a minute later, he gave me a ride the 15 miles home and refused to accept even gas money for his troubles. I unloaded the pickup bed off the trailer, hooked it to the Golf TDI, and retrieved the misbehaving BMW. Scratched the threshing show from my schedule, and rode the ’84 R65LS to the picnic near Fulda I was gonna make on the way home. First thing monday morn I tear into the F800S, despite fully charging the battery the bike ain’t charging at all, voltage dropping as I add loads. Yup, classic BMW F800 fried stator, evidenced by the overpowering smell of burnt electricals as I took off the alternator cover. The stator was quite blackened and crispy, and tested out dead shorted between the three field loops. Yup, this was the long and sorry tradition of BMW “customer engineering’ at it’s finest, a poorly designed stator buried in a housing that reputedly runs 50 degrees hotter than the engine it’s buried in! The purported BMW “fix” is a $900 package of replacement stator and a new flywheel/rotor with some holes it it to purportedly improve cooling… Maybe? Now BMW’s fundamental problem in the motorcycle biz is that they set the bar too high, instead of maintaining low expectations like HOG(NYSE) has so masterfully done. Back in the 60s they built a cadre of seasoned motorcycle engineers, then turned them lose to design and build the all around best motorcycle on the planet ever- the BMW airhead. Then they spent the next decade or so debugging and perfecting said airhead. Then around ’80 or so BMW execs got all nervous… They thought they needed a new bike with more cylinders, hadn’t keeping the 2 cyclinder cars around too long almost killed the company? By then many of the geniuses that gave us the airhead had retired, and “teams” to work on a short term “task” and “outsourcing” were in vogue. So BMW called in Bosch and Showa and all the other contractors and brought in a bunch of engineers and designers from the various car departments and gave us the K bikes. That was such a great “success” that using the same preverse “engineering” process they’ve pulled together the suppliers and whoever’s available from the various BMW departments to give us four generations of R models, a couple more generations of K models, the singles, and now the F model twins… Then all the boys and girls call it finished and return to their respective cubicle farms. Thus we have ended up with a whole series of “customer engineering’ challenges for BMW’s formerly loyal customers- paralever driveshafts, circlipless trannies, flaming differentials, the F800’s fried alternators and burned out rear wheel bearings, what’ll it be next? Worse yet, the girls and boys borrowed from wherever designed an all knowing video display that won’t even tell me that the battery ain’t gettin’ charged, but it’ll happily calculate how many miles before the bike runs out of fuel if I can manage to get it started. And the same group of whiz kids they let design BMWs these days made me take off the battery, air cleaner, fairing, and a bunch of other unrelated stuff just to unplug the stupid stator. But I have to admit, BMW has made me more loyal than ever to BMWs… My airheads. unfortunately they don’t make them anymore. It’s just one of WordPress’ standard formats.